The magnificent award-winning Aphrodite Hills Resort is the first premier golf development in Cyprus and is situated in a breathtaking location with panoramic views over the Mediterranean Sea. The visually spectacular championship-standard 18-hole golf course, lined by indigenous olive and carob trees, gently expands over 2 stunning plateaux separated by a dramatic ravine. Guests and golfers to the Resort will experience lasting memories to be treasured forever. The 5-star Aphrodite Hills Hotel, newly refurbished (2015) and renovated to the highest of standards, offers a first class level of service for the discerning traveller. Having undergone a €4.5million renovation Aphrodite Hills Hotel now offers a multitude of remarkable options for guests. Newly decorated and refurnished rooms and suites offer the ultimate in luxury and also include a selection of sensational ‘swim-up’ rooms. All communal and public areas have been remodelled and modernised, giving beautiful comfortable spaces for relaxation and enjoyment. In-line with the impeccable upgrading of the Hotel, all restaurants and food outlets have been renovated to match the formidable standards now in place. Delicious culinary options include FIG & OLIVE - Mediterranean gourmet cuisine with a combination of antipasti buffet and à la carte dining (evenings only) and JASMINE - Fine Dining Far Eastern cuisine (evenings only). Ascot Golf Packages at Aphrodite Hills Hotel feature All-Inclusive during the summer (April –October) and Semi-All Inclusive during winter (November-March) periods. Group Offers include 1 in 8 FREE with Early Booking incentives throughout the season for best prices. Listed Golf Packages at Aphrodite Hills Hotel include Deluxe Room, All-Inclusive, Golf at PGA National Cyprus and nearby courses & Golf Buggy at Aphrodite Hills. For Summer 2019, Aphrodite Hills Hotel also offers Unlimited Golf! A supplement of 5% is payable for late bookings. Unlimited Golf applies to 7 night packages. For 14 nights, apply 2 x 7 night packages. Unlimited Golf Program: 4 Tee Times to be booked prior to arrival at PGA National Cyprus included with every 7-night package. Book additional rounds FREE at PGA National Cyprus Reception 24 Hours in advance of play. Play restricted to Aphrodite Hills Golf only. Enjoy 5-Nights Unlimited Golf at Aphrodite Hills this winter, with Semi All-Inclusive Board! Group Leaders Stay for FREE at Aphrodite Hills Golf Resort - based on a group of 7 paying golfers. Groups of 8 also receive FREE Airport Transfers (Paphos Airport). Offer Conditions: Group Offer may be not be combined with any further Group discount. Enjoy All-Inclusive at Aphrodite Hills Resort Hotel. EVENING DINNER Eleonas Main Restaurant with an International buffet, live cooking and themed evenings: 18:30 – 21:30 FIG & OLIVE - Mediterranean gourmet cuisine with a combination of antipasti buffet and à la carte dining (evenings only) Ifestos Greek and Grill Restaurant : open daily from 18:30 – 21:30 serving traditional Greek dishes with a modern twist. Asian Corner at Leander: Oriental Restaurant Open Daily from 18:30 – 21:30 offering table d’hote Asian Menu. BEVERAGES include a selection of local mineral water, soft drinks, cocktails, beer, and wine (selected house brands) with your meal, as well as at the Pool Bar, Carob Lounge. All drinks are served by the glass (mini bar items are not included). Local/international spirits (selected house brands), including gin, vodka, and regular whisky will be available at the Carob Lounge, and Anoi Pub (18:00-24:00). All drinks are served by the glass (mini bar items are not included). Carob Lounge Bar and Terrace: Open from 10:00 to 24:00. Serves hot and cold beverages (soft drinks, spirits, beer, wine, etc) Adult Pool Bar: Open from 10:00 to 18:00. Serves hot and cold beverages (soft drinks, beer, wine, etc.). No spirits. Pool Bar: Open from 10:00 to 18:00. Serves hot and cold beverages (soft drinks, beer, wine, etc). No spirits. Beach Bar: Open from 11:00 to 18:00. Serves hot and cold beverages (soft drinks, beer, wine, etc). No spirits. Entertainment Bar: Open from 19:00 to 23:00. Serves hot and cold beverages (soft drinks, beer, wine, etc). No spirits. Offer Conditions: All Inclusive Meal-Plan applies for all months except for Nov-March. For November 2018 & February/March 2019, Semi All-Inclusive applies with breakfast, evening dinner and unlimited house drinks from 5pm-12pm. For December 2018-January 2019, Half Board applies with 1 complimentary drink (Wine/Beer/Soft Drink) prepaid with Evening Dinner. Bars & Restaurants are open seasonally. Guests must produce their all inclusive identity card to receive all inclusive benefits. Vouchers are not transferable and will be cancelled in the event of a no-show. All facilities and times are subject to change without notice. Beverages are served by the glass. Bottled beverages and special drinks are subject to extra charges. The All Inclusive package ends at 12:00 hours on day of departure. Dress code applies in bars and restaurants - men must wear long trousers and closed shoes for all restaurants in the evenings. Listed Package Prices: Listed Golf Package prices apply with All-Inclusive Board. Listed Golf Package prices at Aphrodite Hills include Deluxe Room, All-Inclusive & Golf. Non-Golfers receive a SPA Credit of €195-€275 per 7-Night stay for Retreat Spa, depending on the season. Enjoy 7-Nights Unlimited Golf at Aphrodite Hills this Winter, with Semi All-Inclusive Board! The Aphrodite Hills Resort Hotel has 290 guest rooms and suites, each with special features and luxurious finishes. All rooms have private terraces with pool/garden views and golf/sea views, along with luxuriously fitted and spacious bathrooms. Suites have the option of additional connecting rooms. Some suites have outdoor jacuzzis or private plunge pools overlooking the golf fairways and the Mediterranean beyond. Spacious luxury bathrooms with separate walk-in showers and baths. Deluxe Garden/Pool or Golf/Sea View Rooms (33m²): Contemporary comfort with private bathroom and separate shower. The décor is enhanced with hand carved wood and traditional bedspreads. Accommodates 2 adults and 1 child up to 6 years old. Junior Suites Garden/Pool or Golf/Sea View (42 m²): Spacious Junior Suites with Pool or Garden View offer the same facilities and amenities as Deluxe rooms, with the added comfort of a living area furnished with a sofa bed, which can accommodate a third adult guest or two younger children (12 years or under). Junior suites are elegantly decorated and feature contemporary comfort with private bathrooms, separate showers and vanity units. Junior Suites with Private Pool (42 m² / Pool 12 m²): Overlooking the golf course and Mediterranean Sea, the spacious Junior Suites with Private Pool offer the same facilities and amenities of our other Junior Suites with the added comfort of a private pool for an extra touch of privacy and luxury. Family Room – Garden or Pool View: Family Rooms at InterContinental Aphrodite Hills comprises of 2 adjoining Deluxe Rooms with views of the expansive gardens or pools. Parents pay a supplement for this additional room space, with kids staying and eating for free on the same meal plan as booked by parents. Max. Occupancy, 2 Adults, 3 children 17 years or younger. Family Suite – Golf & Ocean View: Family Suites at Aphrodite Hills comprise of a Junior Suite plus adjoining Deluxe Room with views of the Cabell Robinson Golf Course and Ocean. Parents pay a supplement for this additional living space, with kids staying and eating for free on the same meal plan as booked by parents. Max. Occupancy, 2 Adults, 3 children 17 years or younger. Guests choosing Club Rooms have access to the stylish Club Lounge where they can enjoy the following amenities: Dedicated check-in and check-out reception, Delicious breakfast buffet, All-day coffee and fresh juices, Afternoon tea and pastries, Evening cocktails and canapés, Business services, International television lounge. Club Golf/Sea View Rooms (33m²): Golf & Sea View Rooms are located in the Club section of the hotel with breathtaking golf and sea or garden views, where guests enjoy exclusive, additional privileges. Club Deluxe Suite with Jacuzzi (72 m² / Pool 12m²): This luxuriously decorated suite features a separate master bedroom with walk-in closet and an elegant living room and a separate living room with a sofa bed to accommodate a third adult guest or two younger children. The suite opens to Mediterranean views and a private jacuzzi ideal for an exclusive relaxation. Club Deluxe Suites with Pool (72m² / Pool 12m²): This luxuriously decorated suite features a separate master bedroom with walk-in closet and an elegant living room and a separate living room with a sofa bed to accommodate a third adult guest or two younger children. The suite opens to Mediterranean views and a private plunge pool for exclusive use. Club Presidential Suite (174m² / Pool 24m²): The Presidential Suite offers the ultimate in comfort and luxury with magnificent views of the golf course and the Mediterranean Sea beyond. Two bedrooms complete with en-suite bathrooms are positioned on either side of the spacious living room and separate dining or conference area. All four rooms open onto a vast terrace that extends across the entire face of the suite. A generous swimming pool, separate jacuzzi, sun loungers and garden furniture create a private Mediterranean haven. Accommodates up to 4 adults and 1 child under twelve. Standard Room Amenities (all rooms): Bathrobes, Minibar, In-room safe, Air conditioning, Satellite TV and pay-per-view movies, Direct-dial dual line dataport telephones with voicemail, 24-hour laundry and valet, 24-hour Room Service, Hairdryer. 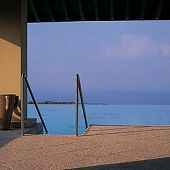 The Aphrodite Hills Resort Hotel offers a tempting choice of chic and relaxing bars, both casual and formal restaurants. Furthermore, the restaurants and bars located at the Golf Clubhouse and the Village Square offer an excellent choice and a true taste of the Mediterranean set in delightful surroundings. Eleonas Restaurant The Hotel's all day restaurant offers an à la carte menu, as well as breakfast, lunch and themed evening dining. It is the ideal place to start the day, while looking out across the terrace through stone arches to the pool and grounds beyond to the golf course. Jasmine Jasmine specialises in Euro-Asian cuisine, combining the finest of flavours and ingredients from two of the world's most sophisticated culinary traditions to create delicious specialities, delicately seasoned with oriental herbs and spices. Ifestos is an informal Italian-style poolside brasserie and refreshment bar with an eclectic a la carte menu. Take a break from sunbathing and swimming and savour the pleasure of dining al fresco! FIG & OLIVE Restaurant features a wine tasting cava, is an authentic Mediterranean dining experience, serving grill & pasta in a delightful setting. With its spacious terrace and panoramic view over the golf course and the Mediterranean Sea, this is the ideal spot for relaxing and enjoying a memorable evening. Las Ramblas Sunset Bar Hotel Guests can enjoy a relaxed and casual atmosphere listening to smooth Latin tunes and enjoy a taste of Spain! The Las Ramblas Sunset Bar features a delicious selection of cold and hot tapas, delectable seafood paella and a luscious oyster station for the true lovers of Spanish cuisine. Carob Lounge Featuring live piano music in the afternoons, and serving cocktails and light snacks as well as afternoon tea and coffee, the Carob Lounge is the place to meet friends, relax and whilst sipping a perfectly chilled glass of champagne, just watch the world go by. The Lounge also features a wide selection of cigars from around the world. Golf Lounge The Golf Lounge is adjacent to the Golf Clubhouse. It is open during both day and night, providing the perfect place for an enjoyable and relaxing time to have a drink, either before dinner or after. Note: Half board & Full board guests’ entitlement can only be utilised within hotel restaurants. All Hotel restaurants are operated on rotation basis and in accordance to seasonal demand. Pithari Tavern offers authentic island cuisine and serves traditional tavern-type food in either the meze or the à la carte variation. Located on the ground level of the Village Square with a stoned paved terrace overlooking the Amphitheatre, and the Mediterranean. The décor is rustic, themed of a Mediterranean island village tavern by the sea. The L’Atelier Brasserie features a spectacular design with a menu of French delicacies. Conceived and developed as a cool place to eat, relax, chat and read, L’Atelier Brasserie features books, magazines and newspapers for clients - the design of the space is minimalist, chic and sleek - an al fresco venue that combines cherry wood floors and pure white furniture with splashes of fuchsia and red complementing the décor and adding a "feel good" factor. Asian Corner offers a combination of Sushi delicacies and Chinese specialities featuring recipes which use fresh ingredients from Asia. The restaurant itself is al fresco with an open and airy atmosphere and the décor is modern and stylish with Asian influences throughout. Secret Garden restaurant offers a Steak House & Stone Grill restaurant set within Village Square. Anoi Pub & Bar is located in the heart of the resort, the first floor of the resort’s Village Square. It boasts a cosy atmosphere with high raised wooden ceilings, indoor and outdoor seating facilities and a terrace area with one of the most spectacular panoramic views in the whole of the resort. There is regular live jazz and wide-screen entertainment. Golfers at Aphrodite Hills can enjoy a spectacular 18-hole Cabell Robinson designed Golf Course, a 4-hole Academy Golf Course, and a covered driving range serviced by a leading team of golf professionals. Zias Beach Club is 15 minutes drive by complementary shuttle located on a beautiful sandy/pebble beach backed by pretty olive groves and vineyards. For resort guests, sunbeds, umbrellas, towels and a bottle of water are provided on arrival. Shower and changing facilities are also available. The Retreat Spa at Aphrodite Hills is a Greco-Roman inspired haven for the senses. Serene surroundings encourage the indulgence of mind, body and soul. An expert team of therapists offer a holistic and comprehensive choice of treatments. The Retreat Spa also offers guests a stunning eternity pool with exceptional views, juice bar and fragrant courtyards for relaxation. The Aphrodite Hills Tennis Academy offers eight state of the art courts (clay plus green set surfaces) and professional coaching services for all levels. There is a pro-shop, changing facilities and a snack shop. Courses for 1, 2, 3 or 5 days can be booked with in advance with Ascot Golf. Other facilities and leisure at Aphrodite Hills include Horse Riding from the stables at the forests of Lakkos tou Frangou, tuition available, Football Academy with FA & UEFA certified coaches, Nature Walking Trails to discover the varied flora and fauna species of the area, Biking Trails within the nearby forests or close to Aphrodite’s Rock (rental available), Multi-purpose Court available for volleyball, basketball or mini-football plus Mini-golf. The Village Square is the focal point of daily life at Aphrodite Hills and a charming rendezvous for owners and visitors alike. Designed to reflect the unhurried atmosphere of a traditional Cypriot village, it stands at the heart of the resort overlooking the Mediterranean Sea. The Village Square has a real community ambience with a great choice of shops and restaurants, a wedding chapel and open spaces that invite you to relax and watch the world go by in true Mediterranean style. As well as the many dining options, the Village Square offers all amenities guests could want or need, including a bank, pharmacy, mini market, flower shop, travel agency, electronics shop, gallery shop, optician and luxury fashion and jewellery boutiques. St. Catherine's Greek Orthodox Chapel is located at the heart of Aphrodite Hills, just two minutes’ walk from the Clubhouse, Village Square and the InterContinental Hotel. The chapel has been designed with traditional Cypriot architecture in mind using local stone and timber, and the interior is beautifully decorated with Christian icons and religious artifacts. The chapel provides an exquisite setting for memorable weddings and other religious events. 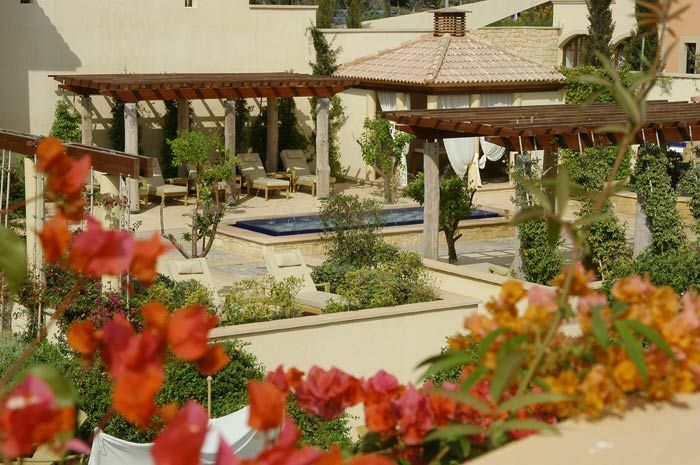 Aphrodite Hills Resort overlooks the birthplace of Aphrodite near Paphos, Cyprus. 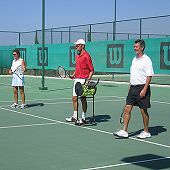 The Aphrodite Hills Tennis Academy (ACTA), the biggest tennis academy in Cyprus, is firmly established as a world-class facility on the international tennis scene. The academy features 9 tennis courts (four clay and five hard courts) and attracts players of all levels to learn or improve their skills in the year-round warm climate and sumptuous surroundings. All of the hard courts are green set surfaced, making them suitable for continuous play in hot weather, whilst the clay courts provide players with an additional choice of surfaces to train on; both of which are used in tennis tournaments throughout the world and recognized as championship standard. The 'Smash-Bar' situated at the centre of the tennis courts offers a wide selection of drinks and snacks. The terrace, covered with shadow sails creates a relaxing atmosphere and welcome shaded area, which invites you to stay and chat together with your fellow tennis players. Book one or more of the following great Tennis Packages for your stay at Aphrodite Hills with Ascot Golf. ACTA “Grand Slam” 5 Day Coaching Course. 5 hours per day coaching & additional complimentary court hire. ACTA “Grand Slam” Daily Rate. Minimum of 2 days participation, excludes complimentary court hire. 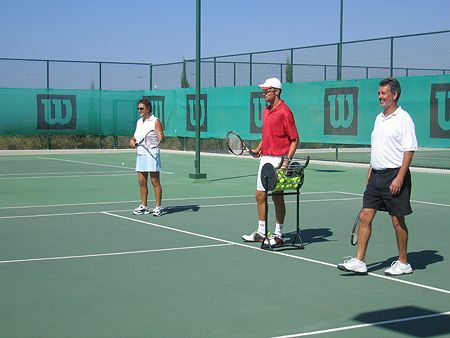 ACTA “Tennis Holiday” 5 Days Coaching Course. 2.5 hours coaching per day, 1 private lesson/2 ball machine hours, additional complimentary court hire. ACTA “Tennis Holiday” Daily Rate. Minimum 2 days participation, excludes private lesson/ball machine/court hire. ACTA “Tennis & Spa” 3 Day Package. 2.5 hours coaching per day, 2x Spa treatments, 1 personal training or yoga session, full daily access to retreat spa. 5 individual lessons with video analysis, 2 ball machine hours, additional complimentary court hire. 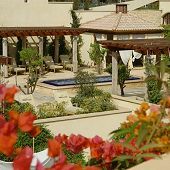 The Retreat Spa at Aphrodite Hills received the highest accolade in the spa industry by winning "The Best Spa in Europe" award at the 2008 Professional Beauty Awards. The Retreat Spa at Aphrodite Hills Resort is a dedicated facility in Village Square – just a gentle 5 minute stroll from the 5-Star Intercontinental Aphrodite Hills Hotel. The Retreat is working Using Pevonia Botanica products and Li’tya Aboriginal products providing an array of specialised skincare treatments, massage and aromatherapy. The Retreat offers the most inviting facilities to make your experience unique. There are five different areas, each designed with charm, beauty and your relaxation in mind. Please see below for a description. 1. The Retreat Spa offers an outstanding fitness environment with state-of-the-art equipment and an unrivalled professional service. A spacious 140 sq. metre Cybex-equipped gym has a full range of CV stations, resistance and free weights and is complemented by a 80 sq. metre sprung-floor, multi-purpose aerobics studio with external garden terraces offering a tranquil environment and excellent views. 4. Lower Level of The Retreat Spa Guests also have the opportunity to indulge in the Spa’s ‘thermae’ facilities. Deriving from the Greek word ‘heat’, thermae bathing is a detoxifying treatment dating back to ancient Roman times and involves a series of heat rooms progressively increasing in temperature, tempered with cooling hydro showers or ice shavings. Treatment rooms, Manicure & Pedicure rooms, Thai couples suite are also located in the Lower Level. Ascot Golf offers excellent rates on 2-5 day Spa Packages at the Retreat. In addition, all Ascot Golf packages at Intercontinetal Aphrodite Hills include a Complimentary Thermae Experience. The Spa Boutique offers unique gifts and lifestyle products for both men and women. As a flagship European Spa for the Pevonia Botanica brand, The Retreat Spa, offers an extensive range of truly effective, natural Pevonia products designed to cater for all skin types. To help familiarise yourself with the Retreat Spa at Aphrodite Hills, please download the most recent brochure in Adobe PDF format. Please ask your Ascot Golf sales agent for further details or to assist in booking your Spa Treatments at The Retreat Spa, Intercontinental Aphrodite Hills Resort, Cyprus. 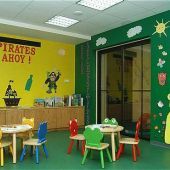 The brand new PIRATES VILLAGE children's activity centre (Opened April 2011) is perfectly located at the heart of Aphrodite Hills Resort. 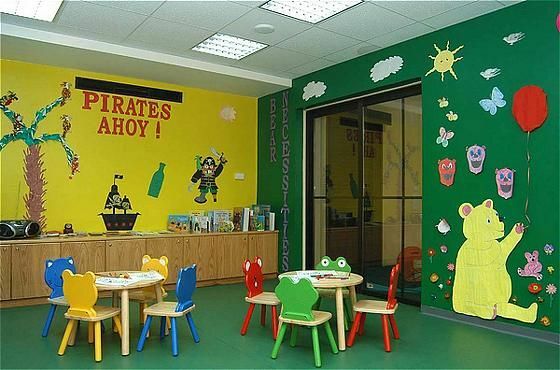 Pirates Village features 3 children’s clubs catering for 3-7 years, 8-12 years and 13-17 years plus a fully supervised crèche for the babies (6 months-2 years). -	shaded play areas, an outdoor adventure playground including bouncy castle and trampolines, a multi sports court area and an outdoor children's pool with active water slide. -	Art & design, dance classes, varied sports activities including mini-Olympics, tennis, basketball, football, mini-golf and water polo. -	The evening entertainment includes karaoke, talents shows, disco and movie nights plus camp outs! All activities are supervised and overseen by our own hotel staff specially trained in child care. At Intercontinental Aphrodite Hills Resort, family groups booking with Ascot Golf are invited to consider Family Room options, which include Family deluxe Rooms with 2 inter-connecting rooms and a Family Suite which comprises of a Junior Suite with inter-connecting deluxe room. Family Rooms and Suites allow for up to 3 children under the age of 12 years. Children up to the age of 17 stay & eat free of charge on the same meals plans as booked by parents with an excellent choice and variety of dining. Please ask your Ascot Golf Sales agent for further details, or include your Family requirements with your Ascot Golf Booking Form for InterContinental Aphrodite Hills Resort Hotel, Cyprus. recognition in Golf, the PGA National Cyprus. million and full modernization, including the rebuilding of greens and bunkers. Top recognition as PGA National Cyprus places the award-winning Aphrodite Hills Golf in the highest positions of Mediterranean golf courses. Elea is a new Championship golf course and recognised by Golf World Magazine as “one of the world’s most exciting new golf courses”. The course layout requires a certain level of strategic thinking rather than strength, and the surroundings incorporate natural features to create a truly Mediterranean feel. Elea golf course is the centrepiece of the Elea Estate, a premium development featuring luxurious villas, wine-tasting, apartments and a boutique hotel in planning. Secret Valley Golf Club is neighbour to Aphrodite Hills within a scenic valley of grand trees and beautiful sculptured rock formations. Secret Valley is the oldest course in Cyprus, with a traditional design, with sloping fairways running through a countryside of fruit orchards and vineyards. This traditional course is accompanied by a rural Cypriot Clubhouse with locker rooms, restaurant, bar and a golf academy with driving range. Minthis Hills golf course enjoys a historical location in Cyprus, situated in the grounds of a twelfth century monastery. Its tranquil setting and mesmerising mountain views provide the perfect backdrop for a challenging game with its fairways swathing through mature trees and water features. At an altitude of 550m above sea level it’s a course for all seasons, enjoying cool breezes even during the summer. Originally designed by Donald Steel in 1994, Minthis Hills has recently undergone extensive enhancement by Mackenzie & Ebert. Widely known and praised for their work on four out of the nine British Open Championship venues, Tom Mackenzie and Martin Ebert have also created 60 new projects in 16 countries during their architectural careers over the past 20 years. The ancient gardens in which the course is set lend a unique flavour, with holes surrounded by grapevines, walnut, almond, and olive trees. Few places are so tranquil for a friendly game, being fun to play for all standards of player, with great variety between holes. Elevated tees invite everyone to “have a go”, yet narrow tree-lined fairways provide a challenge, with each shot requiring careful assessment. The sporty short par four 12th hole is an example, where the green can be reached with a well struck drive, although danger lurks all along the left with the steep valley cascading away. The Clubhouse at Minthis Hills is iconic, designed by world-renowned architects Woods Bagot. The impressive architecture has been complemented by designer interiors and commissioned sculptures providing an ideal social atmosphere. In settings designed to inspire, Minthis Hills offers an array of dining experiences. The lounge, golf terrace and cocktail bar offer the perfect space for pre and post game drinks, while the restaurant transforms the finest local and international ingredients into culinary delights. Accommodation in Deluxe Room Garden/Pool View, All-inclusive, Green fees as listed*, Buggy at PGA Naitional Cyprus, Local Taxes. *Golfers may choose their own preferred golf itinerary from the listed golf courses above. 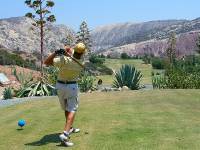 (Minimum of 1 round at PGA Naitional Cyprus for 5 nights; Minimum 2 rounds at PGA Naitional Cyprus for 7 nights).